As this year comes to an end and the new year quickly approaching, I can't help but to feel a bit emotional and nostalgic. There are going to be some major changes next year, one being moving and leaving Santa Cruz which I have lived for the past four years. To be honest, I haven't been too fond of living here just because it is a very small town and doesn't have much happenings. However, it is a beautiful place and I am going to miss being just ten minutes walking distance from the Pacific Coast. People often notice and compliment on the photography of my blog and I believe it has greatly to do with all the lovely locations for which I often shoot at. I mean, having a lighthouse and the ocean behind me ought to be better than standing in front of a garage door, right? Colorblock wool dress c/o 6KS. 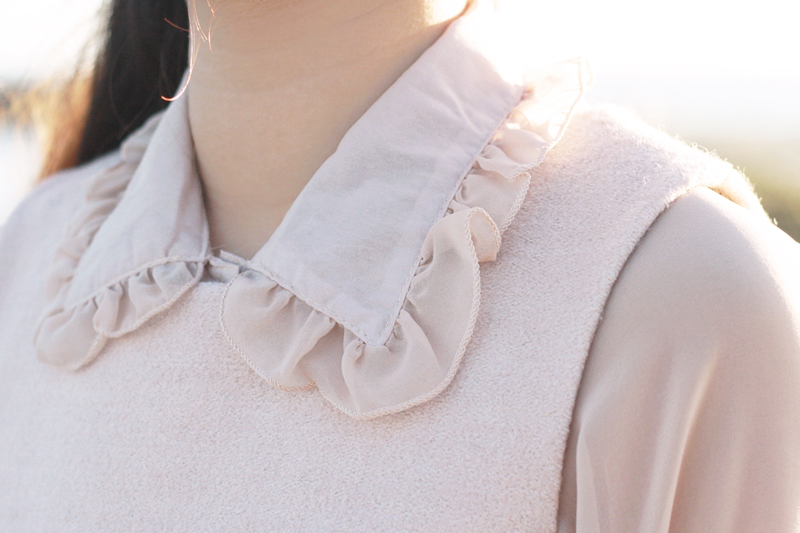 Ruffled collar chiffon blouse from Japan. 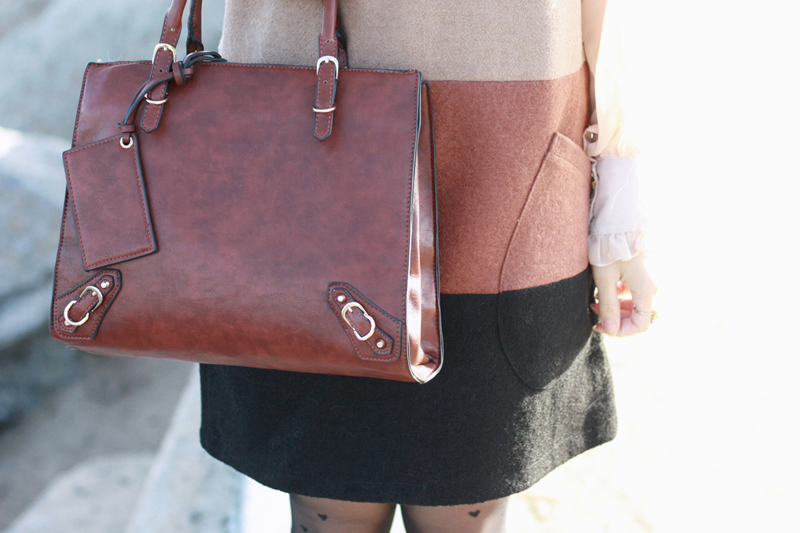 Brown satchel bag c/o Handbag Heaven. Hearts sheer tights c/o Tabbisocks. Glitter bow oxfords by DV Dolce Vita. Tortoise angular sunglasses c/o ZeroUV. I hope that you have a wonderful holiday season! (would you like us to follow each other ? You really do have great locations for your pictures, but I'm sure you'll find another interesting place to take pictures when you move! But anyway, I really love your jumper dress paired with those cute heart tights. Your sparkly loafers are awesome too! Gorgeous look! I love the colours! That is my favorite beach in SC. Seabright? The scenery definitely makes your pictures more unique. 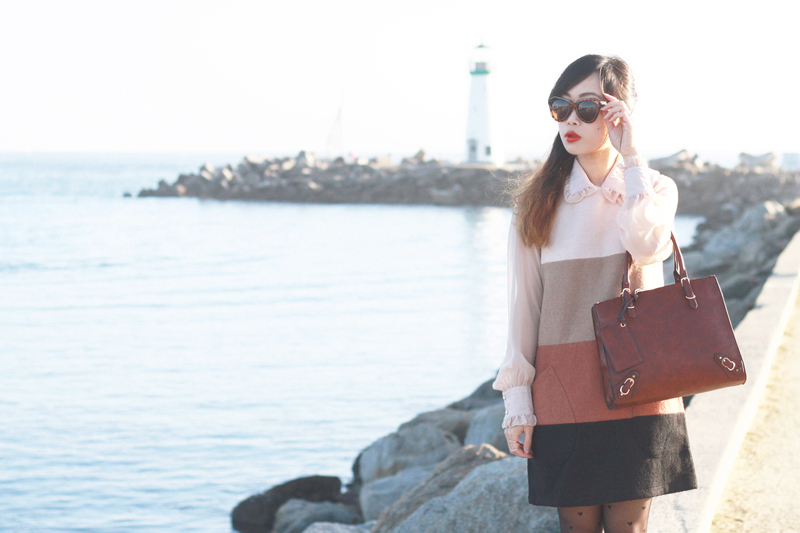 Love the colors of your colorblock dress and your tights are super cute. The color block dress is gorgeous. And I do agree that the background makes photos better, your outfits are always the best part. This colorblocked dress is soooo much fun. And I'm loving the glittery flats, too!